Let's taco-bout the stress and the mess of tangled ear buds. Are you sooo *fed up* with this problem? Then we've got just the DIY for you. 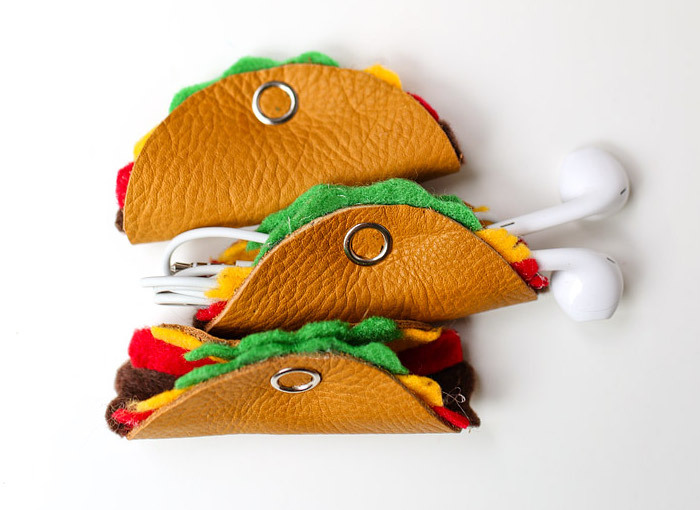 This taco earbud holder is fun, creative and looks ohh so yummy! Use it to hold, organize and store your headphones. No more tangeled messes? Yes please! 2. Cut the circle out with fabric scissors. 3. Now attach the snap buttons to your taco shell. To install: With your parents help, cut a hole with the exacto knife and hammer it into place. 4. Cut out strips of red, yellow and green felt. Make them longer than the taco, but shorter in height. (These are your ingredients). 5. Hot glue the strips into the inside of your shell. 6. Fold up your taco and cut the ingredients down to the size and shape of your choice.